Within a multiple compressor configuration, each compressor is supported by an individual and separate refrigeration circuit. The separate refrigeration circuit makes the servicing of under-maintenance modules easy simultaneously while working module is on duty. The equipment is compact and contains fluid pump as well as storage tank on skid. 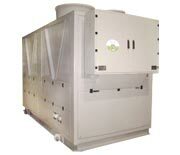 The Brine Chillers are designed with the effort of our diligent staff. We use glycol at low temperatures to bring up the temperature to operating temperature of (-) 50°c. For this purpose, clients can avail various kind of refrigerants like R-22 (Freon), R-407c and R-134a. Both R-407c and R-134a are environment neighborly and non-ozone draining refrigerants. These are available with different kinds of compressor like single stage open type/ double stage open type, double stage semi hermetic, single stage screw depending on different sizes. Raw materials are used carefully for its fabrication depending on their temperature applications. Special alloys like steel or ultra lower temperature is used for the application. These are available in both air cooled and water cooled temperature. 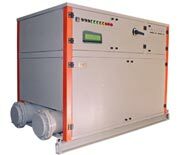 These chillers can work upto the ambient temperature of 480°c and various operating voltages.